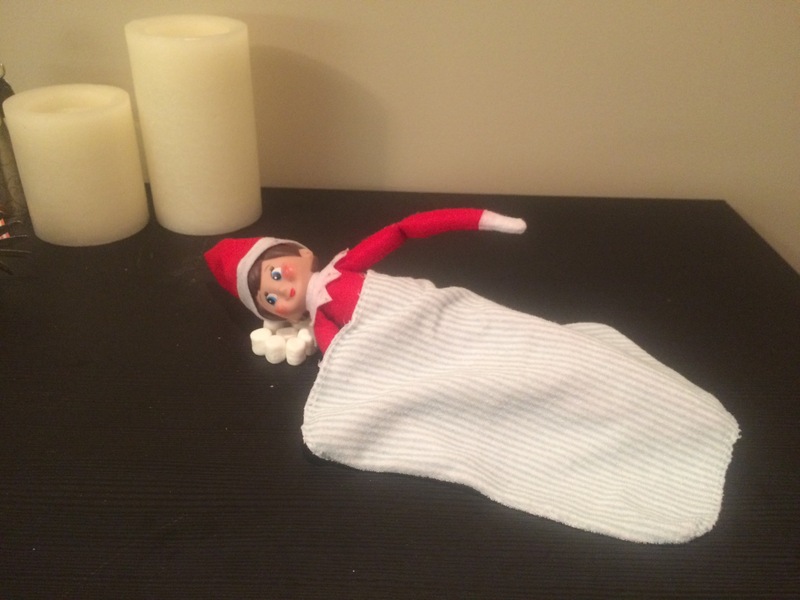 Elfie’s second week has been a busy one! Check out what she’s been up to! 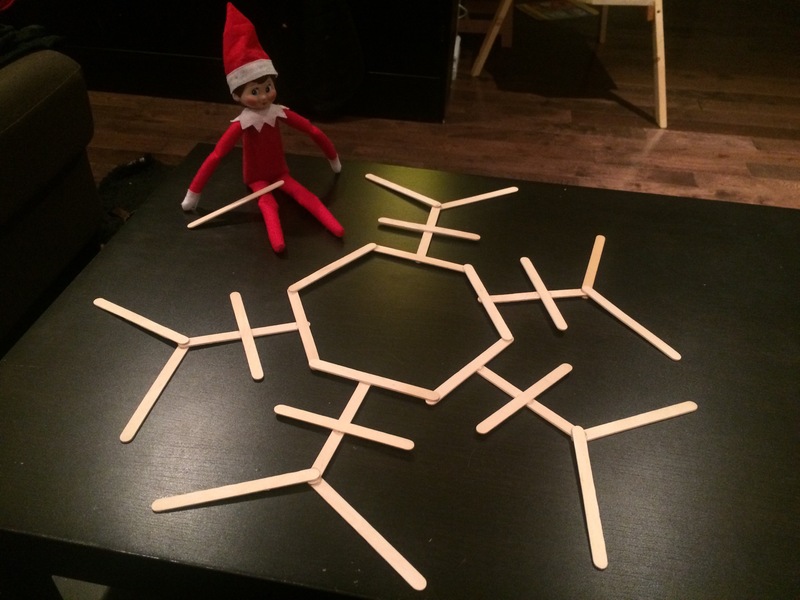 December 14: We caught Elfie Magoo staying up late trying to finish her Christmas craft, a Popsicle stick snowflake! Baby E and I helped her finish it in the morning. December 15th: Sneaking in a little workout before bed. Preparing for all those Christmas dinners and treats to come! December 16th: Coloring is all the rage these days, and can be very relaxing. 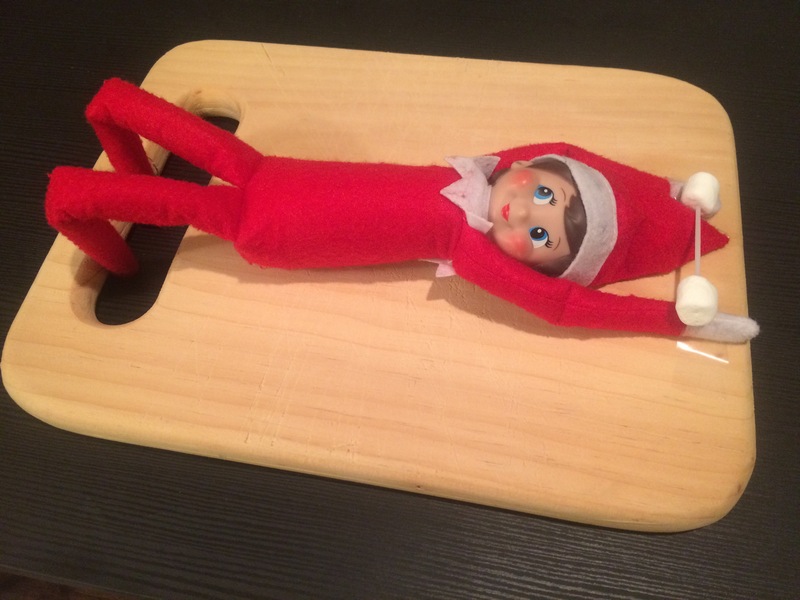 Even Elfie needs a little stress relief as Christmas draws near! December 17th: The closer we get to Christmas, the busier things get for Elfie Magoo. Here we caught her sneaking a little nap with a pillow of marshmallows. 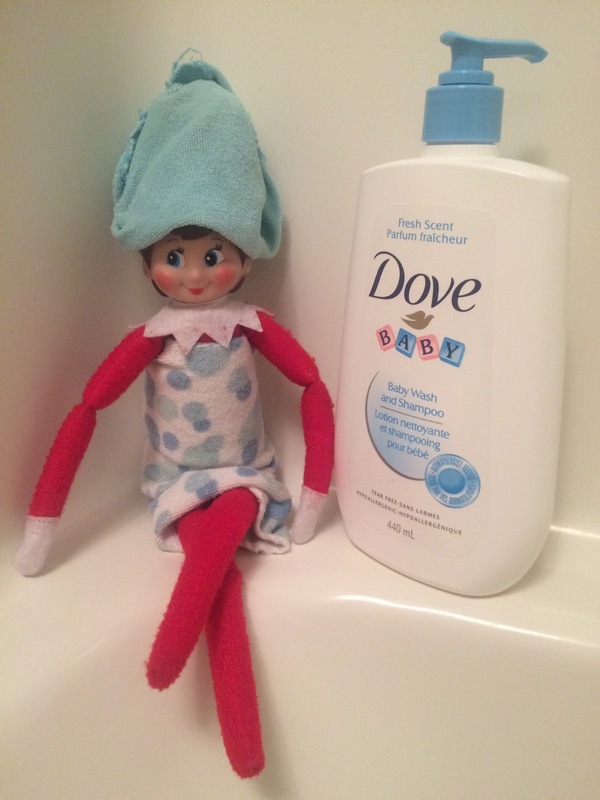 December 18th: Looks like Elfie Magoo just hopped out of the bath! 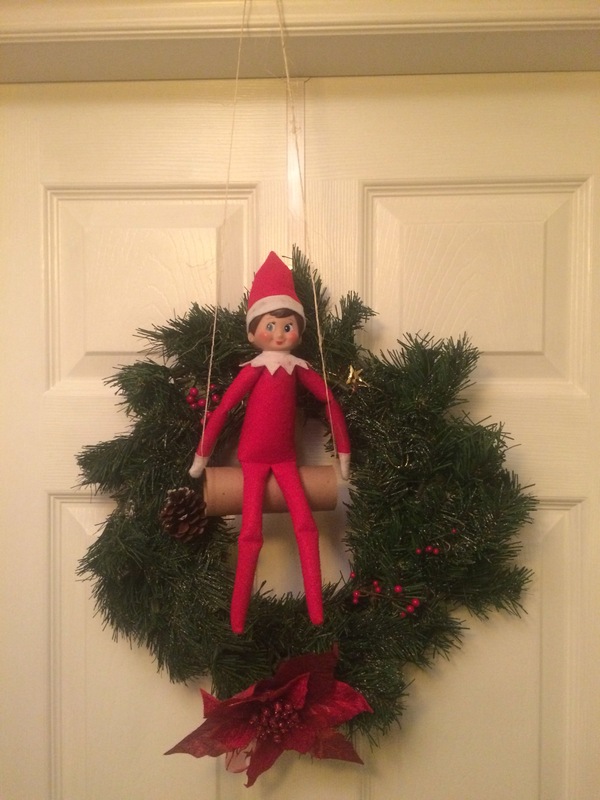 December 19th: Elfie Magoo was swinging from the doorway when we found her this morning! December 20th: What a crafter! 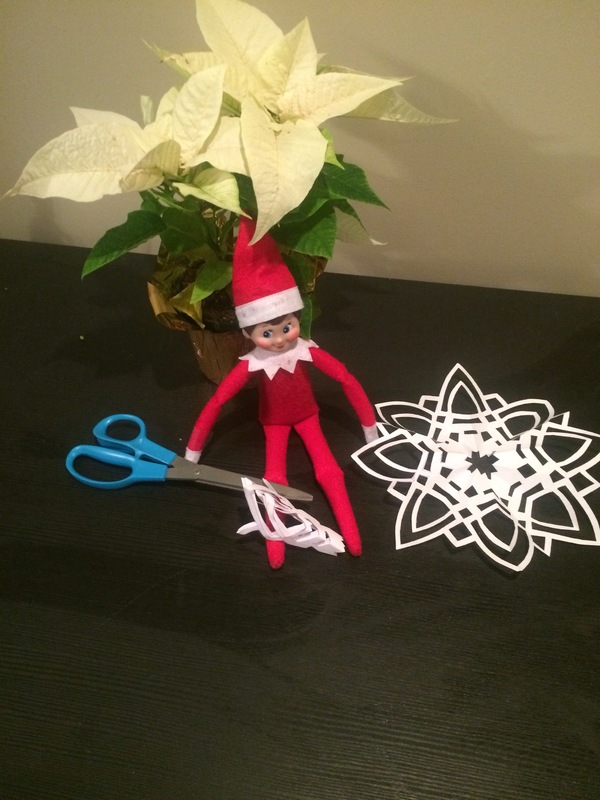 This morning we found Elfie Magoo cutting out paper snowflakes to decorate our house! Baby E continues to love the search for Elfie Magoo every morning! 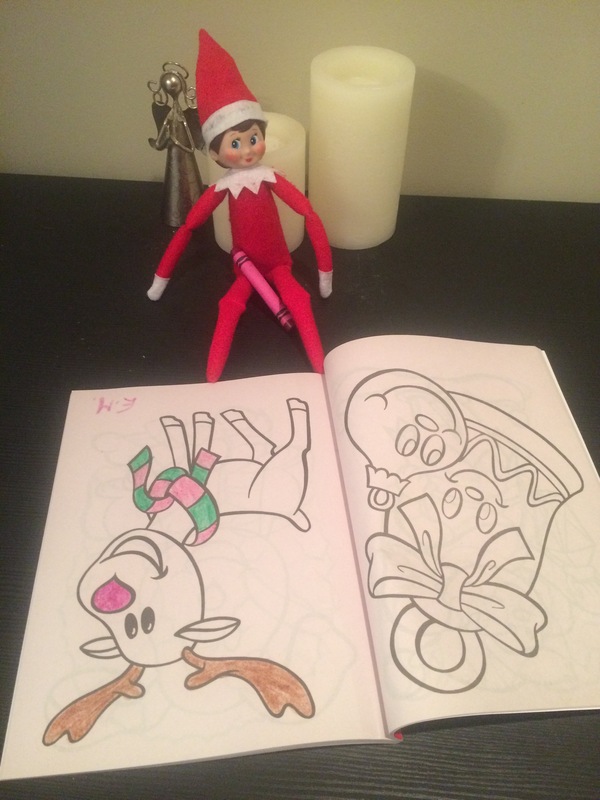 We love finding out what Elfie has been up to! Baby E turned two a few months ago, and it seems to be true what they say about two year olds. As my husband says, she’s become a “two-nager”!! One of the biggest changes I’ve noticed is the recent battle for bedtime. We are anxious for a little bit of toddler-free time to unwind from the day, and she is anxious … well, anxious not to sleep!! Uh-oh. I think we may have contributed to our daughter’s first fear. The next weekend our daughter spent an afternoon with her grandparents. I should say that she absolutely loves her grandparents. As soon as we pull in the driveway, she knows where we are, and starts calling out their names: Nan & Bubba. We once had to pull back out of the drive, to park on the road, and she burst into tears. She really loves them. Anyways, last weekend, Bubba was taking Baby E for a wheelbarrow ride around the yard. They were under the apple tree, picking apples, when Baby E said her first sentence! Well, maybe sentence is a bit optimistic! But our 17-month old strung two words together for the first time! (Proud Mama? For sure!) What did she say? “Bug … Up!”, reaching her arms up to Bubba! Hmm … Did we just contribute to her first fear?! The next time that we see a bug, I will be making a big effort to not move away or act concerned – maybe even to point out how cute it is. We need to do whatever we can to squash this fear!